BADMINTON The team opens the season with two dominant wins. Senior Hanson Gao is one of the top mixed doubles players on the team. 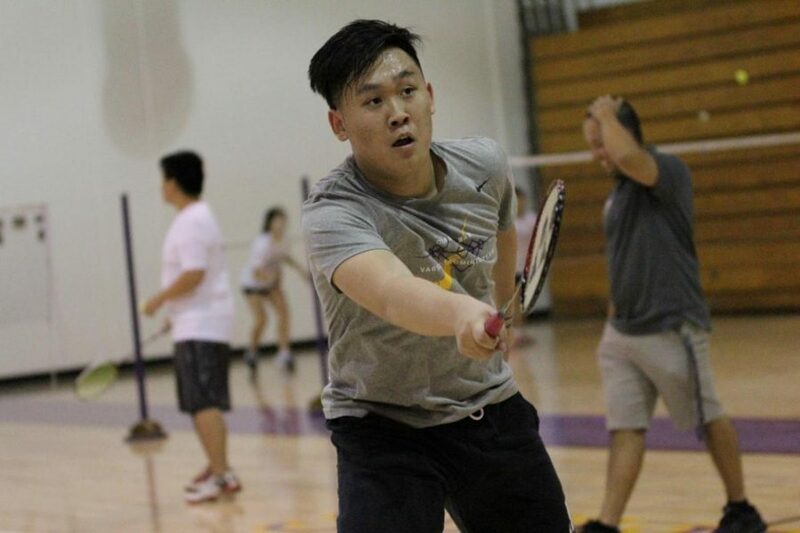 With hopes of adding another title to their six-peat CIF championship streak, the Diamond Bar High School badminton team powered into their first league games with a smash. In their second league match against The Webb Schools, the team saw overwhelming victories in mixed doubles, women’s singles and women’s doubles, winning the overall match 17-4. “We just started, so there aren’t really any truly competitive ones we played yet,” senior badminton captain Jasmine Huang said. Additionally, in their league opener against Chino Hills, there were similar strong performances in mixed doubles, women’s singles and women’s doubles. The Brahmas took home a 19-2 win against the Huskies. In the women’s doubles match, senior Crystal Wai and Huang dominated their competition, sweeping their matches with scores of 21-2 and 21-1. In particular, head coach Kemp Wells points to Huang—who hasn’t lost a match this season—and the mixed doubles team of freshman Claire Wang and senior Hanson Gao as some of the team’s top players. In the match against The Webb Schools, Huang and sophomore Brandon Zhou earned a 21-16 victory in mixed doubles. Prior to the start of league, the team defeated Mira Costa High School 13-8. According to Wells, this year’s mixed doubles players have been the strongest aspect of the team. “Our mixed doubles is probably what’s been carrying us,” Wells said. Both Wells and Huang predict that the team will face off against their biggest rival, Arcadia High School, in the league finals. While Arcadia had been practicing extensively over the past summer and DBHS had to deal with the loss of several top graduating seniors, Wells is still confident that the team can pull off a seventh consecutive CIF title.